Learn how to get yourself out of the IT business so you can run your organization. Your IT infrastructure is no longer a component of your business that can run on its own—it must be managed strategically. Doing it yourself got you this far, but now that you’re growing you need an IT model that can grow with you. Technology changes rapidly, and IT services are now one of the most important facets to nearly every organization. Without expert IT solutions, you risk security, productivity, efficiency, scalability and profitability for your organization. 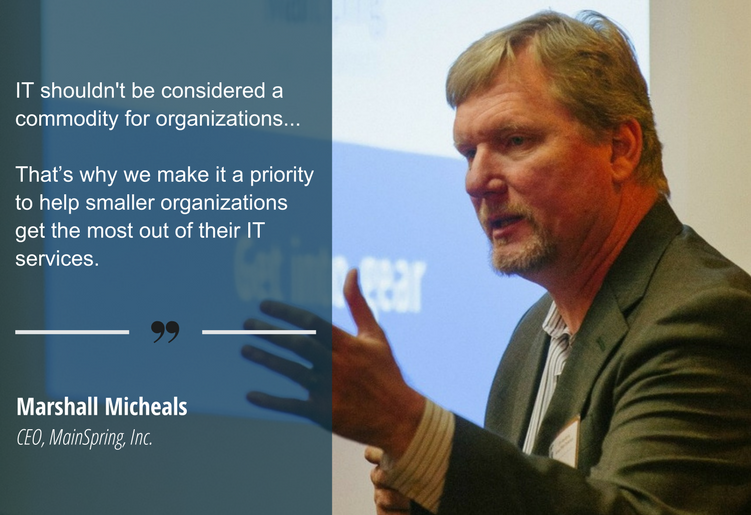 If you feel this way, connect with MainSpring CEO Marshall Micheals to learn what an outsourced IT services model might look like for your organization.